A time travel comedy romance, Peggy Sue Got Married is an amicable journey into the world of second chances. 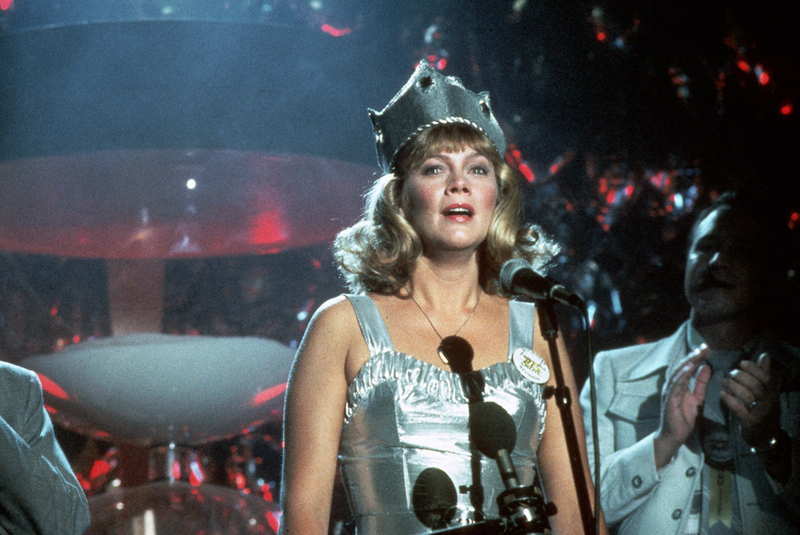 Peggy Sue (Kathleen Turner) is an unwilling participant in her high school's 25-year reunion, but she is prodded to attend by daughter Beth (Helen Hunt). Peggy Sue's marriage to high school sweetheart Charlie (Nicolas Cage) has fallen apart, with Charlie cheating on her after having abandoned ambitions of a musical career to become a cheesy electronics salesman. At the reunion Peggy Sue catches up with old friends and classmates, including Richard (Barry Miller) who used to be the school's outcast nerd but is now a successful businessman. No one at the reunion knows the whereabouts of Michael (Kevin J. O'Connor), the dreamy and athletic class idealist. After being anointed reunion queen, Peggy Sue faints and wakes up 25 years in the past, a few days before her 18th birthday. Her relationship with Charlie is on shaky ground, and although he is full of love, passion and promise, with her knowledge of the future, Peggy Sue cools towards him. She establishes a warmer friendship with Richard, and boldly sidles up to the aloof Michael, resulting in one memorable night. With the ability to make different decisions about the rest of her life, Peggy Sue tries to define what the right choices should look like. After the time-travel-to-the-1950s success of Back To The Future (1984) and the boost of 1960's nostalgia provided by The Big Chill (1983), Peggy Sue Got Married straddles the two and lands in 1960. But rather than the broad comedy of DeLoreans-as-time-machines-powered-by-lightning or the examination of a generation losing touch with its principles, Peggy Sue Got Married is a more intimate, personal experience. One person, one unlikely opportunity to make a few different decisions and change the entire trajectory of a life that has seemingly turned miserable. What will Peggy Sue do? In one of his smaller, more restrained outings, director Francis Ford Coppola keeps the mood light and the spirits high. Once she is transported back in time, Peggy Sue takes her predicament in stride, and settles down to life as an 18 year old teenager with all the benefits that come from 25 additional years of experience. She immediately senses the opportunity to do things differently, and to interact on a mature level with her parents (Barbara Harris and Don Murray) and sister (a young Sofia Coppola, already displaying the wooden delivery that would steer her to directing rather than acting). And at school, free from the clique mind-set of her younger self, she breaks out of her peer group and rectifies two regrets by reaching out to the geeky Richard and the dark Michael. Although her actions in connecting with outcasts serve her ego, she also helps both boys become better men. And by looking again at a young, ambitious and talented Charlie, Peggy Sue experiences again what attracted her to him, and the dangers of a young love that she now knows will go astray. 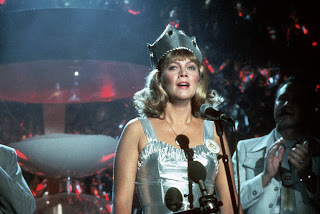 Kathleen Turner, around 32 years old at the time of filming, transitions easily from a middle-aged woman going through a marriage crisis to a teenager enjoying a life of dates, parties, and exam failures. She gives the young Peggy Sue the sarcastic smarts that only come from a life of painful mistakes, much to the befuddlement of parents, teachers and classmates. Turner was nominated for the Best Actress Academy Award. Nicolas Cage, Coppola's nephew and a decade younger than Turner, spends most of the movie as the young Charlie, and delivers his typical messy intensity, this time buffeted by a girlfriend who seems suddenly more self-assured and less entranced by his big dreams of artistic success. Jim Carrey, Joan Allen and Maureen O'Sullivan have small roles in the impressively deep cast. Peggy Sue Got Married arrives at an understated conclusion, consistent with the tone of the movie. Small changes make a big difference, and big decisions can be accommodated with heart, rather than a backlash.